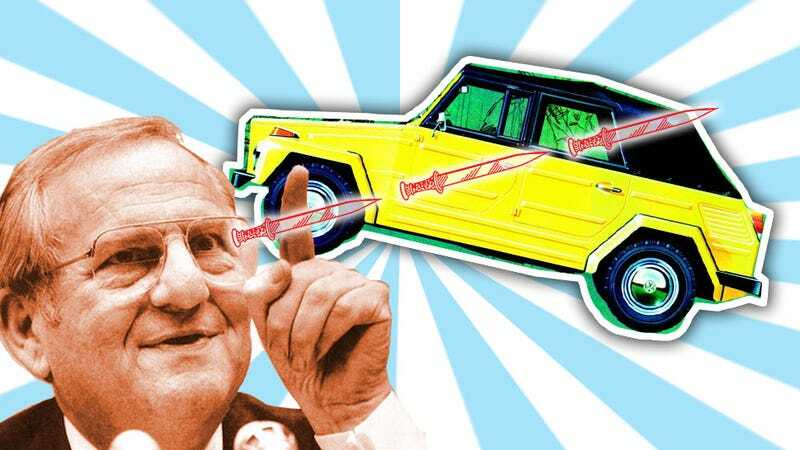 Motor Mystery Monday: Why Did Lee Iacocca Hate The VW Thing? I’ve always wondered why VW only sold their rugged, Beetle-based fun car, the Thing, in the US for only two years, 1973 and 1974. The car remained in production and for sale elsewhere until 1980, and while it was always a quirky, somewhat overpriced oddball, it was gaining a following. Also, Lee Iacocca seems to have helped kill it? What? I’ll back up and give a little more background here. The VW Type 181, called the “Thing” here in the US, was a sort of update to the WWII wartime variant of the Beetle, the Kubelwagen. The 181 was originally developed for European army use while their official Euro Jeep was in development, but it soon was found to be fun and flexible enough to sell in other civilian contexts. It was by its very nature a basic, crude, multi-functional car, designed for on or mild off-road use even though it was only 2WD. Even so, it had a limited-slip differential and geared reduction axles to give better torque and ground clearance. The doors could come off, the windshield would fold down — it was a boxy, corrugated blast. The car was classified as a “multipurpose vehicle” when it came to the US, which freed it from some of the more stringent safety restrictions of true passenger cars. This makes sense when you look at the vehicle, which has more in common with something like a Jeep CJ-5 of the era than, say, an AMC Hornet. However, by 1975, the VW Thing was re-classified as a passenger car, which immediately required it to meet safety regulations that it simply wasn’t designed for, which led to VW pulling it from the US market. Some speculate that VW was looking for a reason to do so anyway, but it seems there were two main figures in this push to kick the Thing out of America: Ralph Nader and Lee Iacocca. “Lee Iacocca was the downfall of the Thing coming into the United States,” John Tritle said. He said about 30,000 were imported in 1973 and 1974, but the former Ford and Chrysler executive pressured the government to classify them as cars instead of multi-purpose vehicles. While I haven’t found that much documentation about Iacocca’s role, I have heard it anecdotally often enough and seen just enough references to think it is based on something. But what I can’t figure out is why. Why would Lee Iacocca, who at the time was president of Ford, have put so much — or hell, any — effort into getting rid of a VW that would be, at best, a very niche product, and didn’t really even compete directly with anything Ford offered? I guess maybe the Bronco would have competed, but I really don’t see the VW Thing as being much of a threat to the Bronco’s more serious off-roading audience. And while, sure, the Thing wasn’t exactly a safe car — and keep in mind, in the mid-’70s not many cars really were — I just can’t believe Iacocca was being a safety crusader here. Remember, this is the guy that was the force behind the Ford Pinto, which was in production at the time, and which had some much more severe safety concerns than the Thing (or at least much more dramatic and better publicized). Sure, the real Pinto safety fiasco didn’t really come into wide public view until 1977, but Iacocca was certainly aware of the possible fuel tank issues of the car as early as 1970 or so. So I’m not buying the safety argument. So, why, then? What was it about the Thing that pissed off Iacocca so much? He didn’t go after the Jeep CJ-5, which had very similar issues to the thing. He had yet to move to Chrysler at this point, and Chrysler’s abortive deal with VW was still years in the future. I’m stumped. If anyone has ever heard of this, or has any insight, I’m quite curious to hear it. So far, my best guess is he was already imagining his future K-Car, and maybe wanted to corner the insanely ugly* and boxy market all to himself. * Ugly by most conventional standards. Personally, I love the way Things look.